nice for its competitors. The track was opened up for practice with no admission or pit fees being charged. Teams were told that they had an open track until the raindrops fell and true to the predictions, the rains did fall in the late afternoon. Unity Raceway was also rained out. Down in Connecticut, the Budweiser SK Modified Nationals were rained out on Sunday. 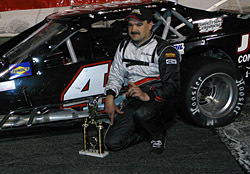 Seekonk Speedway did get their Saturday night racing in despite cold and windy conditions. Dave Darling and Vinnie Annarummo split 25-lap Pro Stock features there. The True Value Modified Racing Series also beat the rain and got their 100 lapper at Monadnock Speedway in the books. When all was said and done, Kirk Alexander ended up being the guy who got the last laugh. The TVMRS returns to action on Saturday night at Seekonk Speedway (MA). Speed51.com will be there. The words Dave Dion and rookie driver have rarely been used together in…oh, about about 40 years. But this weekend, the veteran driver will be a rookie in IBG-PASS competition as he enters Saturday night’s race at Canaan Fair Speedway. Dion’s familiar orange Fords, prepared by his family-owned Dion Brothers Racing Team, have collected winning trophies through the years from ACT, Busch North and even the Oxford 250. He is also the 1996 NASCAR Busch North Series champion. His ride at Canaan will come courtesy of another New England racing vet. Mike Rowe will enter Dion in his own car. Rowe parked his Pro Stock last season after joining the #24 SP2 Motorsports team as their driver. Busch North rookie Charles Lewandoski towed up from his North Carolina shops to race at Lee a few weeks back and he finally made it home this week. His #01 car didn’t get a chance to turn a single lap of competition thanks to the thrice-rained out Whelen 150 at Lee USA Speedway, but the trip was not a total waste. Up in Maine, the IBG-PASS Pro Stocks suffered a rainout at Bangor’s Speedway 95 on Sunday and the ACT Late Models were rained on at Oxford Plains Speedway. The PASS race will now take place on Memorial Day afternoon, while the ACT event has now been rescheduled for the night before the Banknorth Oxford 250 – on July 30th. Last month, Alexander crossed the finish line second in the season opener at Monadnock, but was disqualified for a minor carburetor infraction. So Alexander came back with something to prove and that’s exactly what he did. He took the lead just before halfway and rode to the finish without any serious challenges or tech problems. Les Hinkley overcame a start deep in the pack and an early spin to rebound to a second place finish. Dwight Jarvis, Gary Casella and Sean Bodreau rounded out the top five finishers. 51 PLANS BIG NORTHEASTERN WEEKEND – WEATHER PERMITTING! The latest forecasts for the Northeast are looking up and as long as the rain stays away this week, Speed51.com will have quite a weekend of coverage coming your way. Friday night, we will be at the NASCAR Whelen Modified Tour event at Stafford Motor Speedway (CT), Saturday night, it’s off to the tight Seekonk Speedway (MA) for some Mod racing, TVMRS style. Our holiday weekend wouldn’t be complete without a little bit of fendered action as well and we’ll have that for you courtesy of the IBG-PASS Series at Speedway 95 in Bangor, Maine on Monday afternoon. Lewandoski, along with the rest of the Busch North competitors, got to practice at Lee two weeks ago. He also got the added bonus of being able to test at Stafford Motor Speedway last Friday afternoon before the track’s weekly competitors filed into the pit gates. Although he now calls the Charlotte area his residence, Lewandoski’s hometown is actually Stafford Springs. He competed in the track’s Late Model division and is no doubt looking forward to the June 17th Busch North event at the facility. ACT Late Model driver T.J. Piekarski and Jerry Lesage didn’t play nice earlier this month at Thunder Road Speedbowl and Piekarski is now literally paying the price. The two competitors got together on the track during the feature event two weeks ago. After the frontstretch incident, Piekarski reportedly made contact with Lesage’s car in the pit area. Act officials weren’t impressed and have thrown the book at the sophomore driver. The following statement was issued by the ACT front office. “Piekarski has been fined $1,000 and issued a contingency probation for the remainder of the 2005 race season following an incident in the Thunder Road pit area. Any disciplinary violations during the probation period will result in his suspension for the remainder of the 2005 season and the loss of all points." The ACT Late Models next take to the track at White Mountain Motorsports Park on June 11th. The seemingly endless streak of rainy weekend continues in New England. Last week, the NASCAR Busch North series was washed out on Saturday night and again during their Sunday raindate. There is no word yet on a possible raindate.